The feed water is forced into the boiler by a pump or by an injector The steam pump although not efficient as a steam user if the exhaust steam cannot be utilized is so reliable and requires so little attention that its use is almost universal. 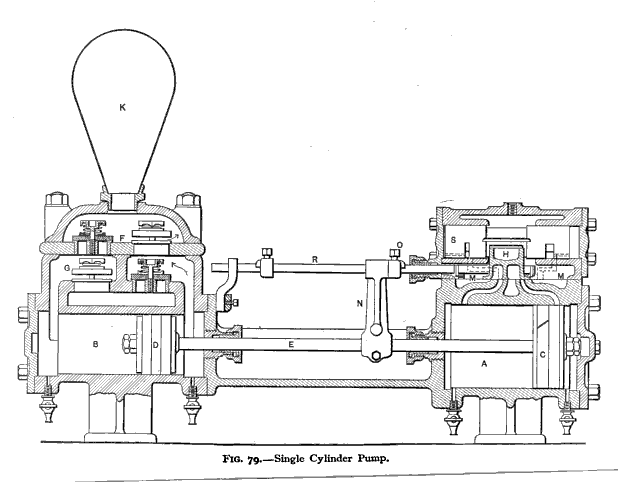 A pump is shown in Figs 78 and 79 A is the steam cylinder and B the water cylinder made of cast iron Within these cylinders are the pistons C and D which fit tightly against the walls being connected by the piston or pump rod E Suppose the right hand end of A to be open to the air and the left hand end to the steam pipe the steam will push the piston to the right driving the water from the right hand end of B through the valve F into the feed line While the piston D moves to the right a partial vacuum is formed behind the piston and water is drawn through G from the source of supply When the pistons reach the extreme right or the end of the stroke this operation is reversed by the valves H and I and the piston is driven backward to the left steam entering on the right of A while that on the left escapes to the atmosphere The total pressure on the steam piston equals the steam pressure per square inch above the atmosphere multiplied by the area of the piston and that on the water end equals the water pressure multiplied by the area of the water piston These two total pressures are almost the same the total steam pressure being greater by the amount of friction in the pump Therefore if we make the diameter of piston C sufficiently larger than that of the piston D the water pressure will be so much higher than that of the steam that the discharge will overcome the friction of the pipes and valves and enter the boiler against the pressure of the steam which drives the pump. 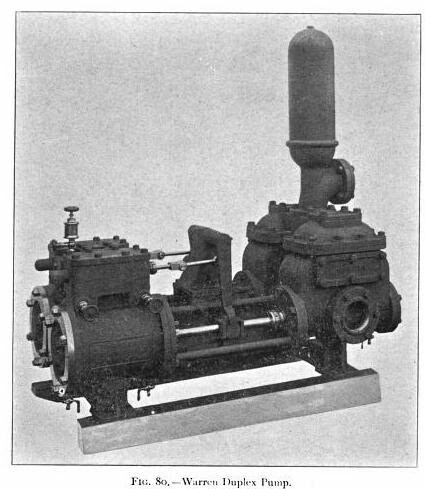 The air chamber K is placed on the pump to equalize the pressure in the discharge pipe as when the pump reverses there is usually a change in the velocity of the water which produces a variation in the pressure and is apt to cause a shock to pipes and pumps The air which is above the water acts as a cushion either keeping up the supply to the main when the pump slows down or receiving the excess pressure when there is an increase in the discharge. The water piston shown in Figs 78 and 79 is so constructed that rings of hemp flax or canvas indurated with rubber can be placed between two discs and forced against the cylinder walls making a water tight joint This canvas or hemp is called packing and the piston is said to be inside packed When this packing is not tight water will leak from one side to the other This leakage cannot be seen and to make sure that there is none the outsider packed plunger as shown in Fig 81 is used This plunger is forced into the water contained in the pump cylinder and thus drives it out When the plunger is withdrawn there is a vacuum produced and water enters to fill the space The only place water can leak around this plunger is at the stuffing box K which is packed in a manner to be described later Should leakage occur it is easily seen and the gland tightened to prevent it. 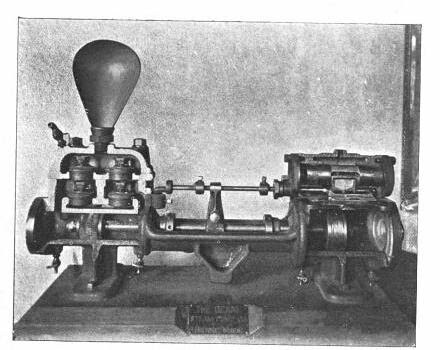 A pump is designated by the diameter of its steam cylinder the diameter of its water cylinder and the stroke Thus a 4" X 3" X 4-1/2" pump is one in which the steam cylinder is 4 diameter the water cylinder 3 and the stroke 4-1/2".